You can disable the scheduled backup job if you do not want to run automatic backup for some period of time. For example, you may want disable the backup job if you plan to perform resource consuming operations on your computer at the time when the backup job is scheduled. In this case, you can disable the job for the time of these operations. After the operations are complete, you can enable the backup job again. Disabling options are applicable only to the scheduled backup job. 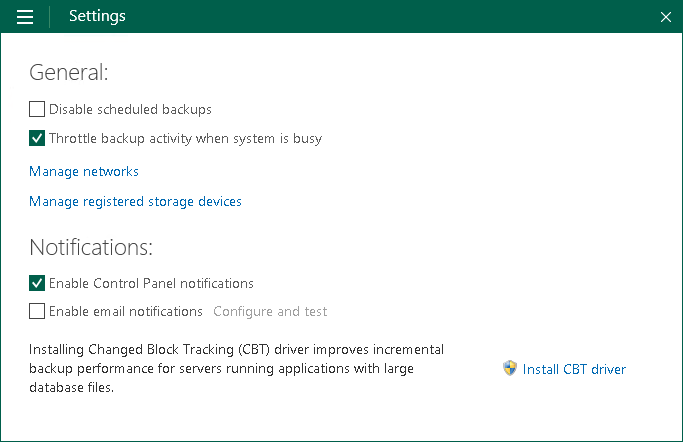 Even if the backup job is disabled, you can create standalone full backups and perform ad-hoc incremental backup. Click the Settings tab at the top of the window. Clear the Disable scheduled backups check box.